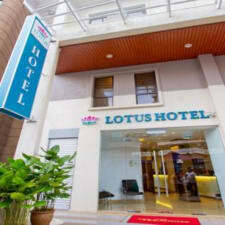 Steps from Petaling Street and the Central Market, the Lotus Family Hotel offers modern, two-star accommodations and free parking. The air-conditioned guest rooms each feature a flat-screen television and free Wi-Fi, as well as complimentary mineral water, biscuits, and coffee. The Lotus Family Hotel welcomes travellers with a 24-hour front desk, while the Tour desk will help you with any information, reservations or tours you might be interested in during your stay. Laundry & ironing service is also available for an additional fee. Travellers will find many casual eateries within a short walk and some of the city's most popular restaurants, including Naughty Nuri's Life Centre and Skillet at 163, are about 20 minutes away on the LRT. The Putra and Masjid Jamek LRT train stations, just outside the hotel entrance, connect travellers to all of Kuala Lumpur's best attractions, including the Petronas Twin Towers, Aquaria, and KLCC Park. The Pavilion KL shopping centre is about 15 minutes away by car. Merdeka Square is a 15-minute walk. Few guests fail to mention the hotel's strategic location in Little India, right next to two LRT stations which offer speedy transport to all the attractions of Kuala Lumpur city centre. The secure parking lot is also a bonus, though travellers enjoy exploring the neighbourhood on foot. Shoppers love being within walking distance of the Central Market and Chinatown. The rooms are widely described as clean and simply decorated, with comfortable beds. Travellers love the hospitable touch of complimentary water and biscuits, a welcome surprise, given the hotel's modest price range. Steady Wi-Fi is also a plus. Travellers often rate the hotel highly in terms of overall value for money. Guests often describe the reception personnel as friendly, welcoming, and kind. Guests often comment that mini fridges would be a welcome addition to the rooms. Some are also disappointed to find the hotel does not serve breakfast. Guests often describe the rooms as small, and wish for more floor space to better accommodate daily prayers. Some guests have been woken up by the daily prayer broadcast from a nearby mosque, while others have found traffic noise to be an issue. Sound insulation between rooms is not perfect, either.